I blog straight from my crochet studio most days per week. Why not? I’m here all the time! Behind the scenes stuff: intriguing crochet swatches, yarn tests, stitch experiments, designs in progress. Professional crochet concerns: quality design tools, photo styling, stash management, staying creatively inspired & organized. 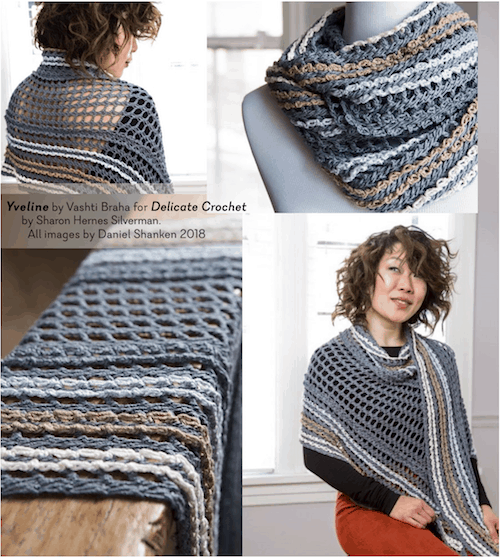 Crochet Inspirations Newsletter overflow. Here it is just a week before I fly out to Portland, Oregon to teach five crochet classes at the Chain Link conference. 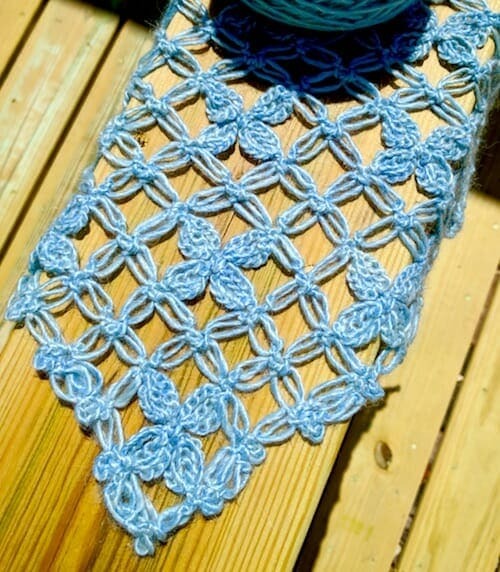 I have a quick update on my preparations for my class on star stitch lace, The Starwirbel Way! Start a Starwirbel with it, or any star stitch project, instead of foundation chains. Once you try it you won’t want to go back. I converted a Starwirbel (tube in spiraling rounds) into a flat rectangular wrap.How to get the same kind of lace as a flat rectangle? People have requested this for years and I’ve swatched it several times. I love this one! (Pictured above, in progress.) It retains for me the experience and special effects of making it. More importantly in the long run, it means we can now use Starwirbel fabric to make anything. For those of us who like to use stitch diagrams, we’ll have time in class to go over Starwirbel’s. Star stitch diagrams can be a bit quirky to understand at first. The class material for Creative Planned Color Pooling changed me. In fact, it’s still changing me. I’ve adjusted its title to take new developments into account (more on that below). 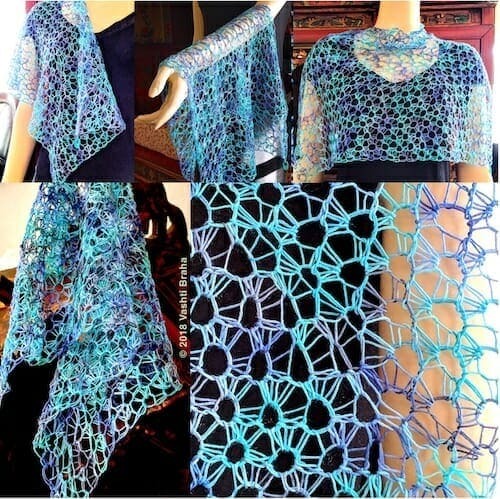 I’d love to have taken a color pooling class like this years ago! In fact I’d rather learn it in a class than from a pattern or blog. The next time I teach this class: July 28, 2018 in Portland, Oregon. Developing this topic changed me as a crocheter. It showed me what I take for granted about crochet how crochet works. I think it’s because for the first time, something else (the yarn’s color sequence) replaces crochet standards that have always worked for other kinds of crochet. These popcorn stitches vary but it doesn’t matter. Here’s one: uniformly even stitches are beautiful. We aim to make uniform stitches to get a lovely, polished result, right? Beginners practice until they can be proud of how even their stitches are. Why would one question this? When you’re intentionally pooling (I think of it as color directing), it’s the yarn’s colors that you aim to make uniform. The evenness of your stitches is second to that. A pretty distant second, which was shocking to me. Why? That brings me to a second way this class material changed me. On a bigger and more personal scale, my relationship to color changed! It was like watching my brain re-prioritize what it was seeing. My eyes rejoiced when the yarn’s next color stacked up the way I wanted it to. The stitches for making this happen became almost interchangeable. Even the stitch gauge could vary. Especially when the pretty color pattern emerges from seemingly random chaos. Especially when it’s like there’s a secret code in a multicolored ball of yarn and you’ve just cracked it. The crochet stitch and gauge becomes a strategy: change the crocheting a bit to get a color to stick with the pattern and it works! The eye doesn’t see certain stitch irregularities. It’s too captivated by the color patterning. Also, the nearby stitches will adjust. 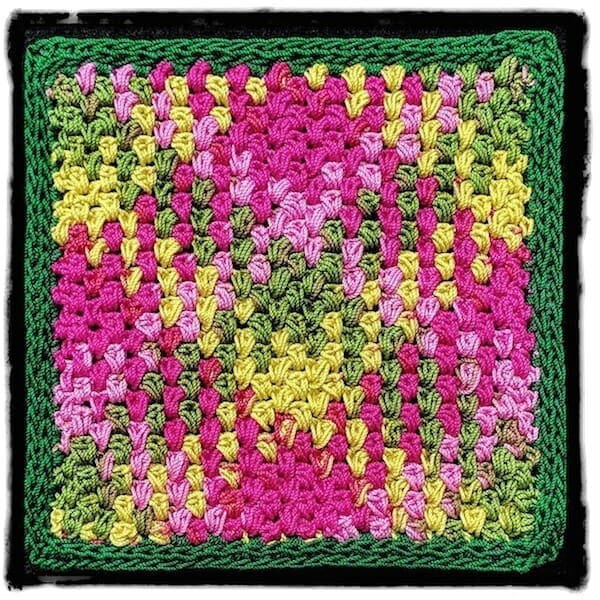 Since my 2016 class, more crocheters have mostly been finding out from blogs about doing planned color pooling (a.k.a. intentional yarn pooling) with variegated craft store yarns. I’m seeing people make a cool argyle effect using the linen stitch (a.k.a. seed stitch, moss stitch, granite stitch): each row is [sc, ch 1, skip next st], and you crochet the sc of the next row into the ch-1 space of the completed row. See this stitch in the colorful Aquarienne edging, Peaches handbag opening & handle, and Quailfeather. Accidental argyling happened with Barista. From a distance you can see a soft (but intentional!) argyle in this tweedy swatch and an argyle effect getting going in this swatch. I came to this topic a completely different way, via hand dyed yarns. It’s easy to identify the dye techniques, such as hand painting and dip dyeing, because these yarns tend to be sold in the hank the dyer used, not wound into balls. When I learned from Marty Miller how hyperbolic crochet works (2006 or so), I crocheted her a hyperbolic coffee cozy secretly based on her birthdate. A hand dyed yarn with a vivid yellow in it made me want to set it off with love knots. “Love Games” was the result. I even sold a coffee cozy to a yarn company back in 2006 because I referred to it as a game. Why “Creative Planned Color Pooling”? Earlier versions of this class were “Stitch Games for Yarns With Short Color or Texture Changes” (2016 in Charleston SC) and “Stacked Color Pooling” (2017 in Mt. Pleasant IL). Planned pooling is becoming a recognizable term for more crocheters. I suspect that only seed stitch argyles come to mind for some. Also, some folks seem to think this is math based, but it doesn’t have to be. At all. Creative is the important part of the new title because we’re still at the early stages of what is possible. There is way more to planned pooling than seed stitch argyles. What about lace and tall stitches? Shaping? Tunisian? I want crocheters to experience the possible! And of course to be changed by it. The class resources page for this topic is updated as of 4/16/18. Want to see what I’m working on? This will be Flowerfall, a hanky-hem waterfall vest that I can wear when I teach 21st Century Love Knot Adventures this July in Portland, Oregon. I’m now two-thirds done. I’m designing Flowerfall to be a visual aid for several skill levels. I’ll also be adding the pattern to my shop for those who can’t attend the class. What the classic love knot (aka Solomon’s knots) mesh is and how the rows go together. How it looks to use love knots in place of foundation stitches and turning chains. Updated things you can do with this mesh, such as this waterfall vest. How the yarn choice affects the stitch. Another view of this diamond mesh would be the love knot sections of Lovelace. (It’s so iconic that the stitch is synonymous with the mesh in some how-to sources from the 1800’s to now.) Then, compare it with the Electra Wrap’s triangular love knot mesh. How to increase and decrease this mesh, and add picots as one way to finish the edges as you go. The when, why, and the how-to: making love knots with slip stitches instead of single crochets (UK: dc). My new favorite way to keep love knots from loosening later if the yarn is slippery. A new way to crochet into love knots that I recommend for a project like this one. How to do corner to corner (C-2-C) love knot mesh in which you start in one corner and end in the opposite one. How to sprinkle in other stitches with the classic love knot mesh to create lacy new stitch patterns! This is my seventh year shipping teaching aids across the USA for crochet classes. I teach four to six different topics per event. Visual aids are everything! I always end up with a lot of crochet items to ship. In the past few years I’ve started designing class items that combine several points of information in one. Not only do I cut down on the shipping this way, it’s a fun design challenge. I also love coming up with how a design for one class topic can double or triple as a visual aid for other topics I’m also teaching. I’ll post again about this design so that you can see its modified diamond shape, how its armholes happen, and different ways to wear it. I’m smitten ? . Flowerfall’s Flickr album has three photos so far.